For many the original Windsurfer holds huge favour as it was the do it all family board that got everyone out sailing at weekends, whatever the weather and/or location. 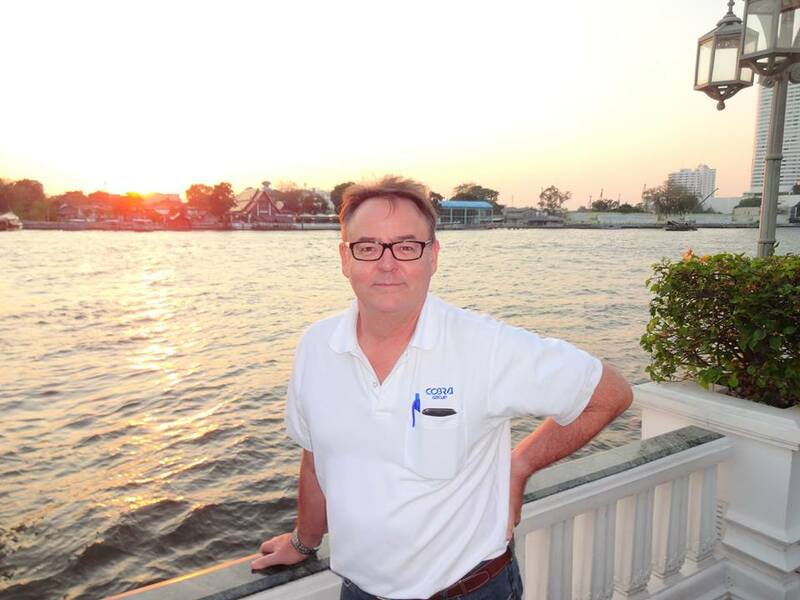 With the recent announcement from Cobra International that they have brought the Windsurfer LT back, albeit in modern guise, Windsurfing UK caught up with project leader Bruce Wylie, a former one design champion in his own right, and now head of watersports at Cobra International. Why have you decided to revisit the original Windsurfer concept and bring it back to the masses, albeit in slightly updated form? For Cobra and from my personal standpoint this project was always about getting more people into the sport and also keeping them involved. We decided to create a true multi-use board, suitable for SUP, beginners and one design racing, and kicked the project off with that aim. It was shortly after we’d started that the Italian Windsurfer class association asked us about an updated board design and we were able to say we’ve already got something in mind that would be perfect. Tell us a little about your background and involvement in the project. Do you think there’s room for this type of windsurfing these days, if so why? 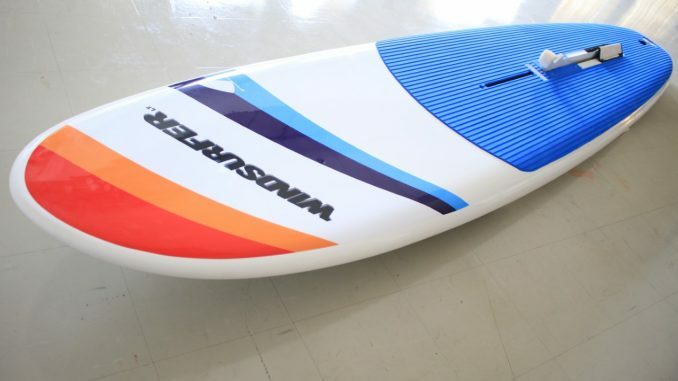 We certainly do think there’s a demand for this new board and for this type of windsurfing and the feedback has been incredibly positive so far. This project was always about creating a board for everyone, a true family multi use board that is truly effective for the 3 functions it was designed for: SUP, beginner and one design. Give us your thoughts on what riders can expect from the old/new Windsurfer in terms of performance. The biggest difference versus the old board is weight. 15kg vs 21kg. Epoxy construction will help durability and longevity too but the light weight is what brings the biggest gains in performance and ease of handling. 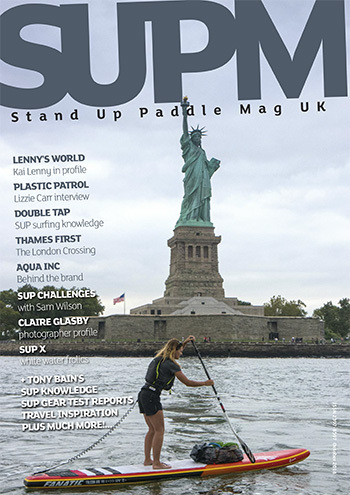 The wider width, mainly to help the board perform well in SUP mode, is also a big help for beginners. How do sailors go about getting hold of one if they fancy demoing or purchasing? There are already demo boards in Italy, Australia and Japan. With the Windsurfer class associations being the best contact point for a demo sail. We’ve standardized the price for the board with the Windsurfer class and other Cobra customers and really want to bring this project to the market at attractive price levels to support the project and rebuild the participation in the sport of windsurfing. 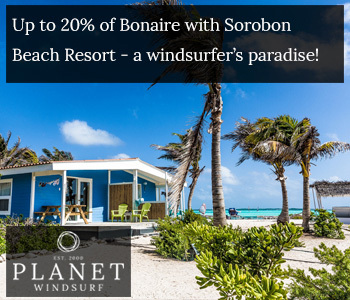 The boards will be available around the world via Windsurfer Class Distributors, or through the normal distribution channels of other windsurfing brands. What about the class as a whole? Are Cobra (you) going to be getting more high profile Windsurfer events going again? At the moment we have no plans to organize Windsurfer events ourselves, the class associations already do an amazing job there. We’re there to support the sport with high volume production of the new boards. 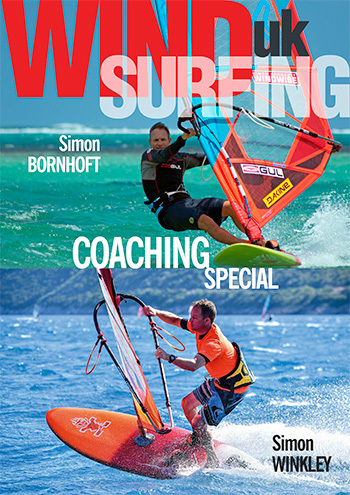 How do you think the updated Windsurfer will fair against higher performance craft? Do you think sailors will still go after planing boards rather than stump up for something like this? As I said earlier the feedback has been amazing. Of course there is always a place for planing boards and for foiling boards too. Our view, and what we’re hearing from the market, is that there is also a want/need for windsurfers looking for lighter wind equipment. 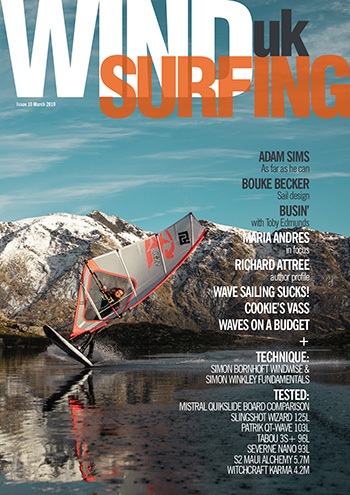 Are we about to see a full on renaissance as far as non-planing windsurfing goes? We hope so! We want this new board to be the one that’s always rigged up on the beach or by the lake and to be the one people reach for to get on the water and have fun. Is the Windsurfer going to be badged up as Cobra product or under another moniker? The boards will carry the Windsurfer LT logo or the logo of the brand that’s marketing them but all boards will also carry a made by Cobra mark too. Any final words on the Windsurfer class? Only to say how much we’ve enjoyed working with and receiving feedback from the various Windsurfer class associations around the world and that we’re really looking forward to seeing lots of the new boards out on the water. 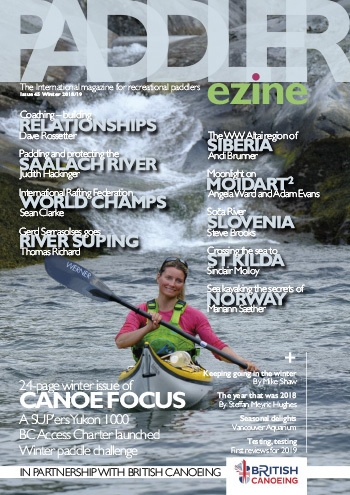 This is awesome news for us die hard old school windsurfers. 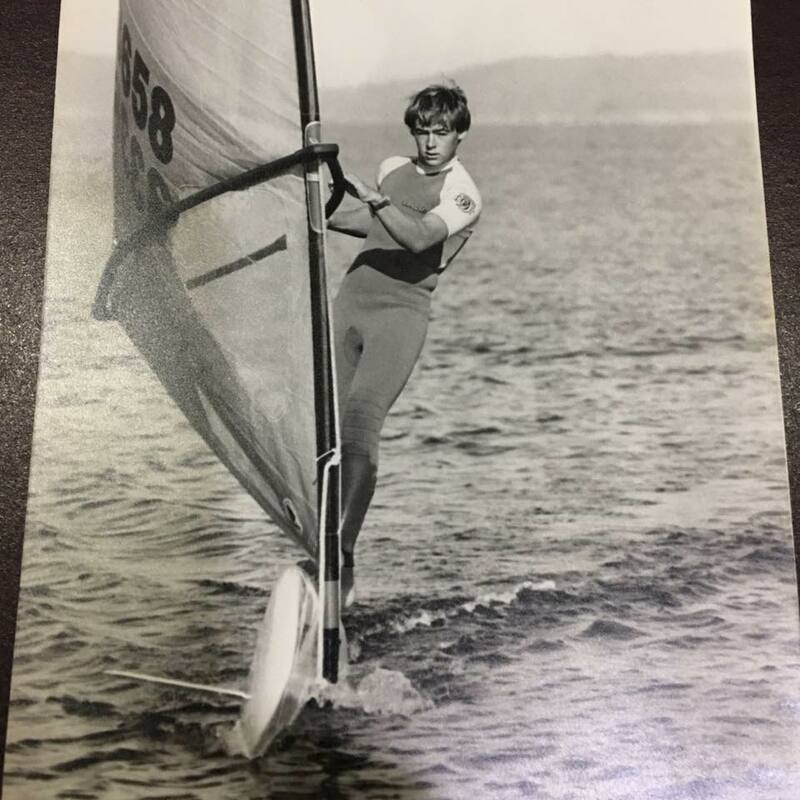 I too have been windsurfing since 1982 and still love the longboard cruising over much of anything else. Great job Cobra, I know you have been in the game a long time and I applaud your contributions to reviving the true origin of this great sport and family fun. I cant wait to see this product in Florida! I windsurfed back in the USVI in 1980’s and have the weather and water to do it here in Florida once again. Would love to see it make a come back here in Florida..please contact me if you need any product assitance here ! Rebirth of a classic . I have my original freestyle still from the 80’s and will be getting a new board/rig.. I can’t believe I’m just finding out about the real windsurfer being back because it seems like a while already . Would love to see a huge US presecence like Europe . all the other boards are fine but nothing beats the classic!!! PS nice rail ride shot. Brings me back !!!!!!! When will they be available in the States? Having sailed one of the new Windsurfer LT boards since April in Australia, I can inform you that this is a very versatile board! I have allowed numerous sailors to try the new board and everyone has given awesome feedback regarding ease of use and speed. It handles stronger winds much better than the old one design and original Windsurfer and planes really well. It will prove to be a good board for beginners, Leisure sailors who prefer light winds and for anyone who loves higher winds as well. 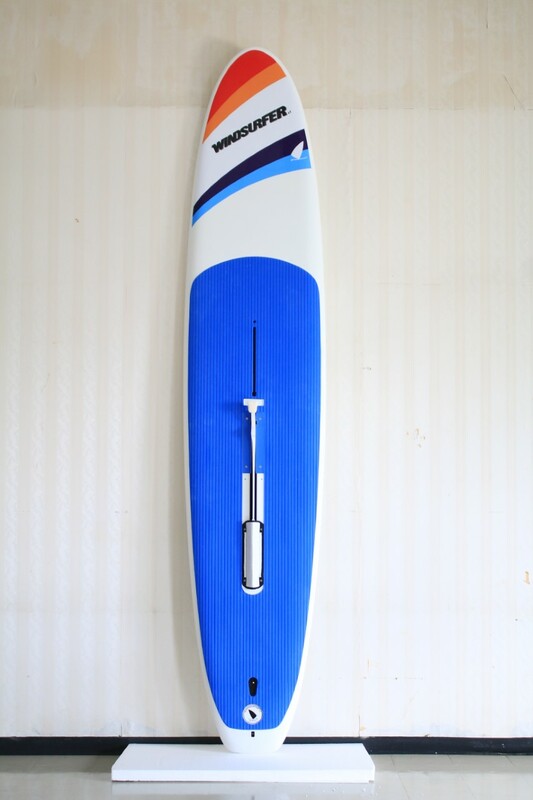 It is sure to be successful as a successor to the One Design Windsurfer for class racing. Everything is simple on this package, featuring a fantastic non slip deck which funnily enough negates the need for footstraps! A simple and straightforward fully retracting centreboard and small fin and standard mast track. Same sail and boom as previous generation with the addition of a two piece mast. No high tech complicated stuff to add expense and clutter the deck. The familiar sail is only 5.7M but is well suited to the board. The hull shape allows the board to plane early and it tracks really well up wind and is easily controllable downwind and on reaches. It has a larger volume than the old boards and is much easier to handle at 15kg. Back to the Basics, a true retro classic that brings back the simple pleasure of windsurfing for the whole family. You will not regret purchasing this board!